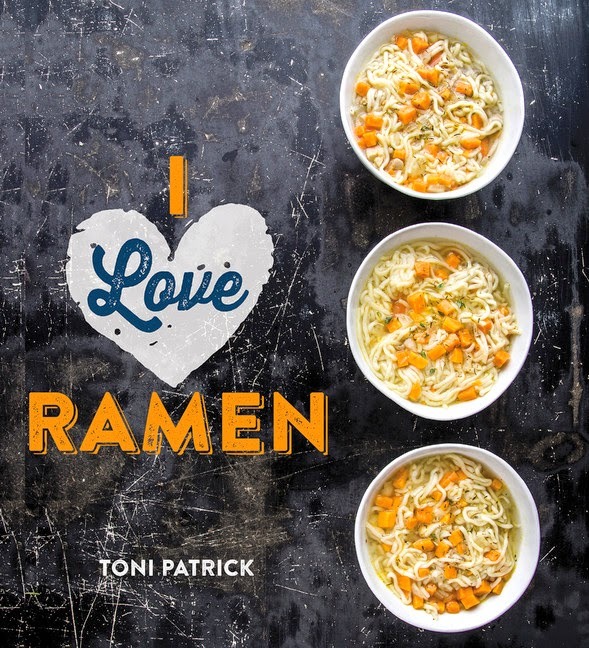 For our next giveaway, we have "I love Ramen" by Toni Patrick. If necessity is the mother of invention, a college student's food budget certainly led to the invention of some delicious ways with one of the least expensive, most convenient packaged foods of all time. Taste-tempting food photos show that the humble block of ramen noodles can be magically transformed into delicious main dishes as well as sides, soups and salads. There are even a couple of desserts based on the ever-popular ramen noodle. On the ramen menu: Beef & Broccoli Stir-fry, Crab Lo Mein, Baked Stuffed Tomatoes, Fiesta Chicken, Cheesy Bacon Noodles, Ramen Rolled Steak, Tangerine Chicken Salad, and even Thin Mint on a Stick. All made with magical, versatile ramen! Toni Patrick is also the author of 101 Things to Do with Ramen Noodles, 101 Things to Do with Mac & Cheese, and 101 Things to Do with Canned Biscuits. She lives in Colorado.